First, a short introduction to how this all came about. Lately, I’ve been interested in iPhone applications. The one thing that Apple did really well (after some initial crack) is to deliver a SDK and ecosystem to extend the iPhone with all the crap that you could come up with. Most of them are games, I don’t really play games, but some of them are quite useful. Suddenly the very thought of carrying 20 items with you to office every day feels really tragic. Don’t get me started about all these devices that are lingering around at home in the living room. How many remote controls do you have? You can probably imagine that I would love the Blackberry a lot, too. For my studies, I use PowerPoint. A lot. Imagine my excitement when I found that several applications existed to use your iPhone as a remote control for PowerPoint, such as iClickr and iPresenter. Both failed in the usability department, especially when compared to Apple’s Keynote iPhone Remote application, and therefore I decided that I would have to write my own. 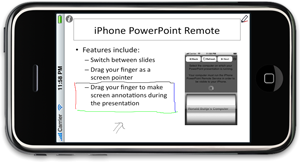 I present you: iPhone PowerPoint Remote (more screenshots available by clicking the link). The application is available in the Apple iTunes store, and requires a small piece of software to run on your host Mac, available here. This entry was posted in General and tagged iphone, mac, ppt remote. Bookmark the permalink. The obvious question is, how hard would it be to port the daemon to Linux and OpenOffice? Great question. I wish, first and foremost, that PowerPoint was available for Linux, because it really is a killer app. OpenOffice’s Impress has never really impressed ( ) me much. It acts and feels slow and sluggish. If PowerPoint were available, that’d make the whole thing a lot easier – and I’d probably be more willing/ready to do it. Anyway, now for OO.org / Impress: my feeling is that you could write this as a UNO component. I havne’t looked too closely, but I don’t think you can “script” OpenOffice.org from the outside, like you can do on the Mac with Applescript and on Windows with VBA – for either PowerPoint or Keynote. For OO.org, plugins (UNO) can run on the inside, though, and have more functionality than plugins for Powerpoint, which are basically VBAscript document extensions…), so that would be an alternative way to accomplish the same.